In early October I came across this article in the Evening Standard when my house mate brought it back to our flat one evening and pointed it out to me. 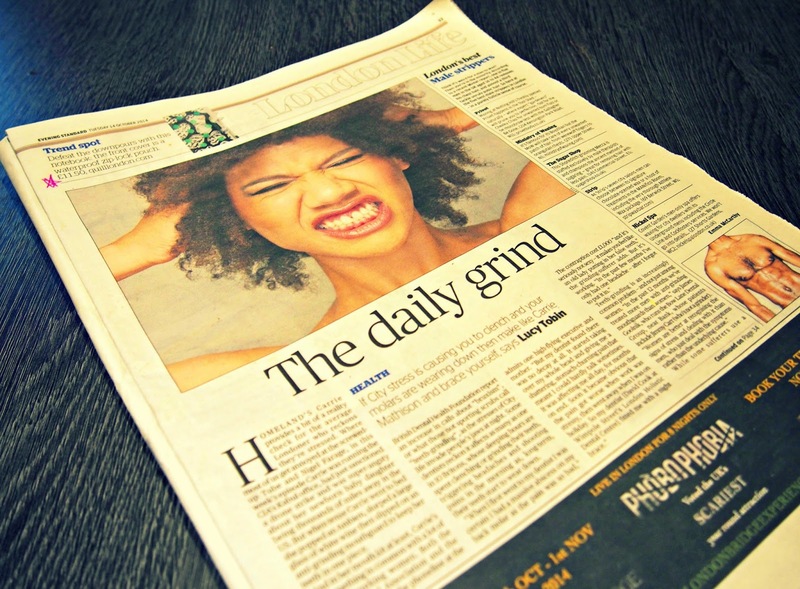 The article speaks about Bruxism - a condition that some dentists think can affect as many as one in 10 people in Britain! Patients will often wear down their teeth and have aches and pains associated with their jaws as a result of grinding or clenching their teeth at night-time. Lucy Tobin reports on how teeth-grinding is an increasingly common problem amongst city workers with the stress of their daily lives taking its toll on their teeth. As a frequent grinder myself, I can emphasise with the dull ache that patients can commonly experience on waking but the pain can rarely be much more severe than just an achey or clicky jaw. Whilst the most common treatment for bruxism is some form of mouthguard or splint to wear at night time, this isn't the only option. Wearing something at night time isn't always appealing to every patient or even possible. I find it very difficult to sleep with my mouthguard in - I always play around with it and my tongue can't find a comfortable position so it keeps me up longer. Other options include Botox injections, mandibular advancement devices (MAD) or hypnotherapy. Other options may be more suitable for daytime clenchers too. From my experience I often find myself clenching my teeth together when providing patients with more complex treatment - I can't exactly wear my mouthguard when treating patients! I'm really glad I found this article and that the Evening Standard chose to feature it as I feel like bruxism is a condition that the general public aren't really that aware of despite its high prevalence. To see the original article please see the Evening Standard's website. Ever been told by your spouse that you grind your teeth? Or do you wake up with headaches in the mornings? You might be a tooth-grinder! Please share your thoughts and experiences in the comment section below!